Encrypting data doesn’t have to be expensive, difficult to implement, or time consuming. Using VirtuCrypt Elements’ Managed Point-to-Point Encryption service, your organization can quickly and easily add P2PE functionality to an existing infrastructure and let VirtuCrypt handle the compliance, data center allocation, and device management for you. Point-to-Point Encryption is a way for organizations to ensure that data is encrypted across all end points, protecting information during transit and only decrypting it once it has reached a secure destination. Should a malicious entity intercept information during transit, that data would be encrypted and therefore unreadable. VirtuCrypt is able to provide encryption of data from the point of interaction until decryption within the physical security of VirtuCrypt’s FIPS 140-2 Level 3 Secure Cryptographic Devices. This P2PE functionality enables organizations to significantly reduce their PCI compliance scope and expense. P2PE Element services take advantage of a shared VirtuCrypt infrastructure, with customer-controlled keys that ensure separation of environments. These encryption keys are managed either through VirtuCrypt key agent services or by the customer via the Securus. Organizations can access their P2PE Elements service through the VirtuCrypt Intelligence Portal (VIP), a web service that allows for VirtuCrypt-specific tracking, management, and scaling. VirtuCrypt’s Element functionality doesn’t end with P2PE. Your business can also leverage VirtuCrypt Elements for Remote Key Management, Object Signing, Debit Processing, and more. 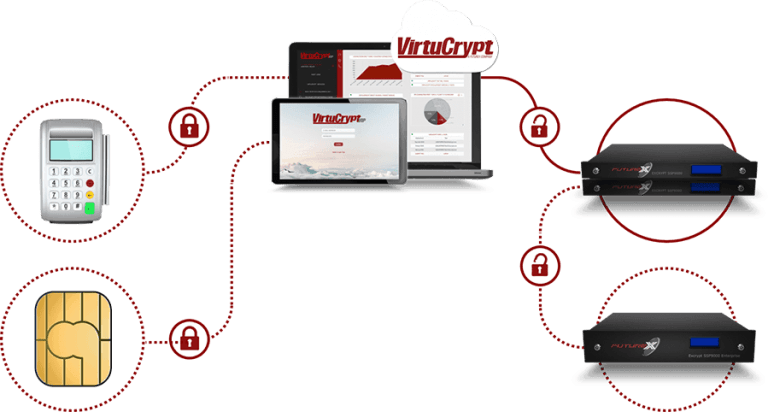 Each of these VirtuCrypt Elements has individual benefits, but a combination of these offerings will elevate your organization’s data security and compliance. P2PE Elements come in transaction packages that allow you to choose the number of encryption processes that your organization will use on a monthly basis. Have a spike in traffic? Increasing the number of available transactions is as simple as contacting the VIP help desk.